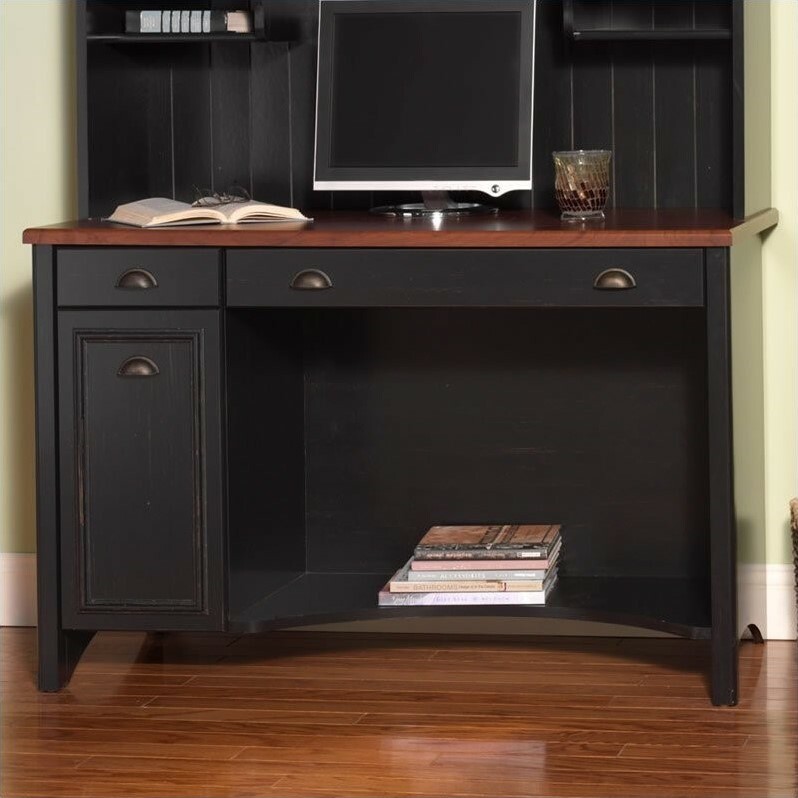 Blend style and functionality in your home office with the Bush Furniture Stanford Computer Desk with Drawers in Antique Black. With a durable and charming Hansen Cherry top surface, the Computer Desk has room to spare as you surf the net or spread out paperwork. The black desk offers a beautifully distressed finish paired with elegant Antique Pewter hardware and unique design details. Stack electronics or books on the convenient knee-well shelf, and set up your keyboard or laptop on the drawer with a drop-down front. Keep office supplies at your fingertips thanks to the built-in box drawer, and get organized with a closed storage compartment behind an attractive framed door featuring smooth self-closing Euro-style hinges. An open slot behind the Computer Desk allows easy access to power cords, cables and wires. The Computer Desk accepts a coordinating Hutch (sold separately) and matches any piece in the Stanford Collection. See the full collection for additional home and office items available. Stanford meets ANSI/SOHO quality test standards for performance and safety and comes with a Bush Furniture 6 Year Manufacturer's Warranty. With casual styling and traditional detail, Stanford offers an alluring appearance without sacrificing functionality. 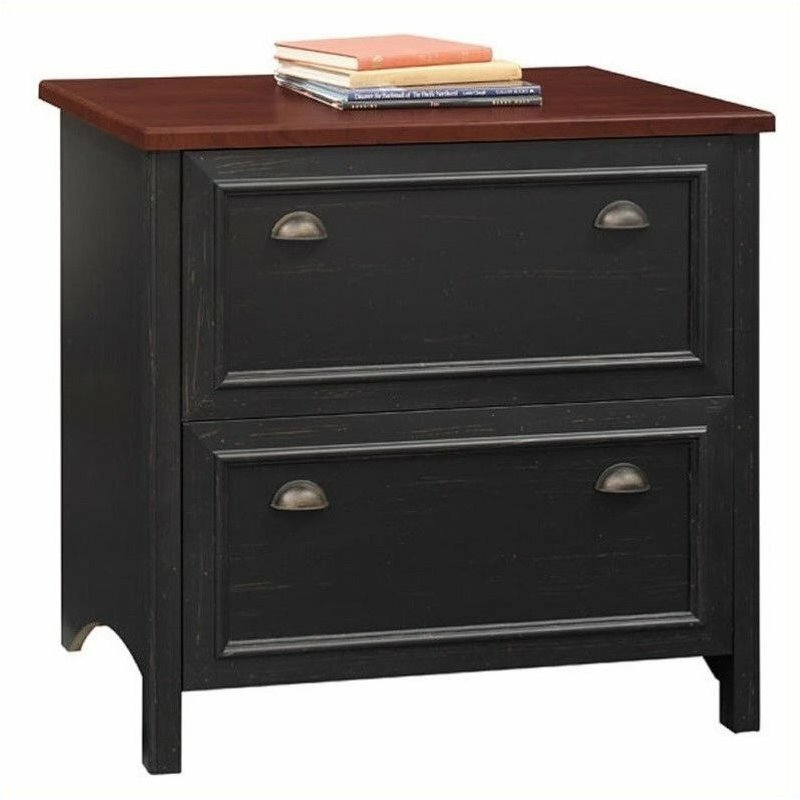 Blend style and functionality in your home office with the Bush Furniture Stanford 2 Drawer Lateral File Cabinet in Antique Black. The charming Hansen Cherry top surface and beautiful Antique Pewter hardware join the distressed finish and framed drawers to blend perfectly with existing decor. Height matches the Stanford Computer Desk (sold separately) for an extended work surface when positioned side-by-side. Full-extension file drawers glide on smooth ball bearing slides for easy access to letter, legal or A4-size files, even those buried all the way at the back. An interlocking drawer mechanism prevents tipping for added safety. The 2 Drawer Lateral File Cabinet has a small footprint, allowing it to be placed virtually anywhere. Stanford meets ANSI/SOHO quality test standards for performance and safety and comes with a Bush Furniture 6 Year Manufacturer's Warranty. With casual styling and traditional detail, Stanford offers an alluring appearance without sacrificing functionality. See the full collection for coordinating home and office items available, including the Computer Desk. 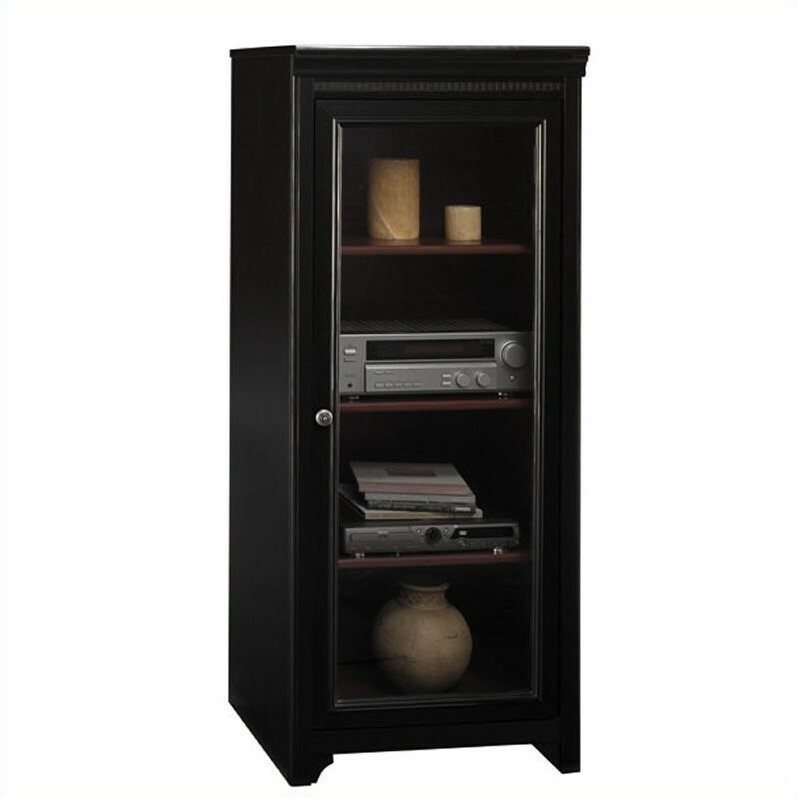 Blend style and functionality in your home with the Bush Furniture Stanford Media Cabinet with Door in Antique Black and Hansen Cherry. Two adjustable shelves provide flexible storage for CDs, DVDs or AV components while one fixed shelf offers added stability. The tempered glass door protects electronics from dust, and rear access makes wire management and cable concealment quick and easy. Decorative dentil molding joins the Antique Pewter hardware and traditional details to give the black Media Cabinet a look you'll admire for years. Backed by a 1 Year Warranty. With casual styling and traditional detail, Stanford offers an alluring appearance without sacrificing functionality. See the full collection for coordinating items available. Bush Furniture is one of North America's premier office furniture brands. With over 50 years of industry experience, Bush Furniture is a proven, trusted name in business and home office products. Find solutions for all of your workspace, organization and storage needs, for just one person or for a whole team. Cymax offers one of the largest Bush Furniture collections online with sale prices every day. No need to search for a discount outlet! Bush Furniture offers coordinating options to fill your entire workspace, starting with computer desks and storage items such as bookcases and filing cabinets. Bush Furniture cleverly designs collections that are modular and can be scaled up or down as required. Look for a full range of stylish finishes that make these already affordable products an even better value. Start off by choosing the foundation of your office. A Bush Furniture desk is the perfect start for your trendy transitional or contemporary workspace. Look for Bush Furniture computer desks and writing desks that feature clean, simple lines as well as ample storage drawers and cabinets. Add a matching hutch from the same collection or go for an extra cabinet as needed for commercial or work-at-home spaces. Bush Furniture products can be customized to suit any size, style, or taste. Increase your storage and get organized. 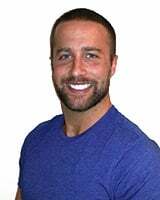 You’ll find cherry, maple and black durable finishes in Bush Furniture bookcases and filing cabinets that coordinate easily with their popular desk units. Selected bookcases feature filing cabinet drawers for a handy space-saving alternative. In addition to their impressive selection of office products, Bush Furniture manufactures a great selection of entertainment items, including TV stands and audio racks. These entertainment pieces are an excellent choice to coordinate media display and storage with your workspace.